Ring in 2019 in style in downtown Pensacola's largest private event space, the Skopelos Grand Ballroom! Decorated to the nines, Skopelos at New World's prime downtown spot will host an all night party with premium open bars, midnight champagne toasts and party favors, and a large open dance floor with the best music from DJ Matt Powell of Powell Entertainment and live music from The Red Field. After the champagne toasts, the chefs from Skopelos will fill you up with a gourmet midnight breakfast buffet. 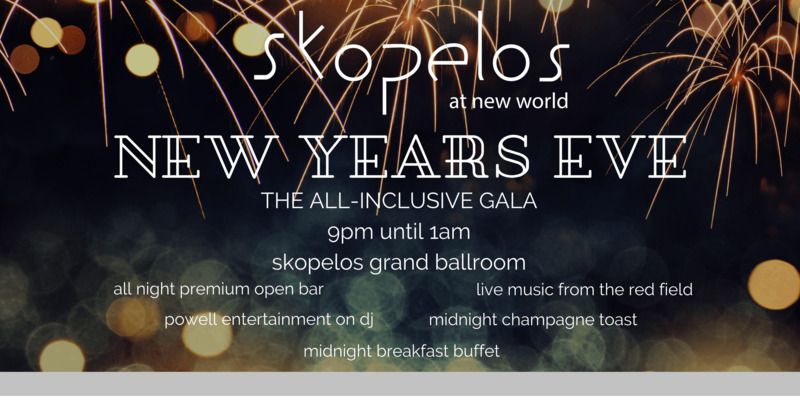 The Skopelos New Years Eve party will take place from 9pm - 1am with free parking available for guests both on-site and in locations located directly next to the venue. TICKETS: All-inclusive (admission, open bar, music, dancing, party favors, midnight champagne toast, breakfast buffet). $95 pre-sale or $125 at the door, plus tax. Open bar will include Titos, Dewars, Jim Beam, Bombay, Canadian Club, Jose Cuervo, Bacardi (other general liquors, such as Jack Daniels, may be available by request); major domestic beers; house wines. End 2018 and kick off 2019 in the place to be in downtown Pensacola! Tickets are available through Eventbrite or in person at Skopelos at New World, or by phone at (850) 432-6565. No processing fee will be added if you purchase in person or by phone. Skopelos is located at 600 S. Palafox St., one block south of Main St. in the location formerly known as New World Landing. For more information, visit skopelosatnewworld.com.